Have you met the Carpenters? If you have not yet seen our new CARPENTERS range then you are in for a treat! Aaron has made a bold move away from the hugely popular oil barrel designs and has reimagined some wonderful characters from hardwood pallets. Each piece is finished with a timber oil, which not only makes them suitable for any climate, it also gives each piece that luxurious timber-log feel. As you would expect the new range is quirky, fun and stunning so unsurprisingly we sold out immediately! We hope you like the names, finding quirky names for our products is always a fun and creative process and for the CARPENTERS we looked to Hollywood stars, songs and movies for inspiration. 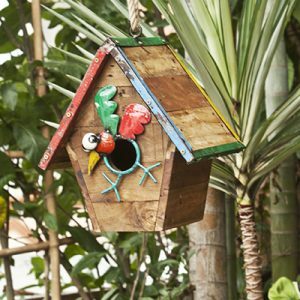 This funky birdhouse will add a touch of cheer to any garden. 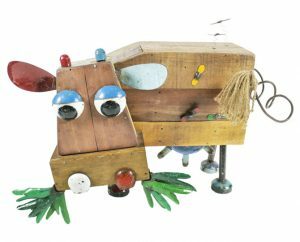 It’s made from hardwood pallets and uses the recycled barrels for the colourful metal finish. Another quirky design but with a distinctive high roof design. It’s made from hardwood pallets and uses the recycled barrels for the metal finish. 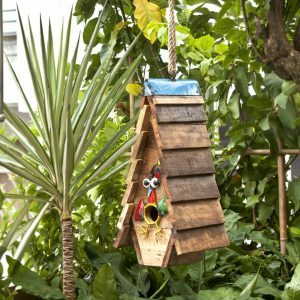 There is no assembling required and it’s the perfect home for your wild garden birds. 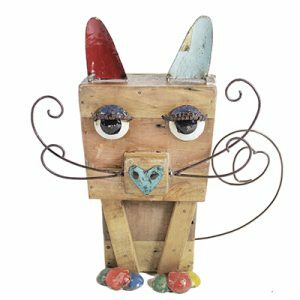 This super cool kitty Kat is made from recycled hardwood pallets and her glamour eyelashes, toes an nose are made from recycled oil barrels. Her tail and whiskers are removable for easy storage. Bette D will make a cute addition to any home. 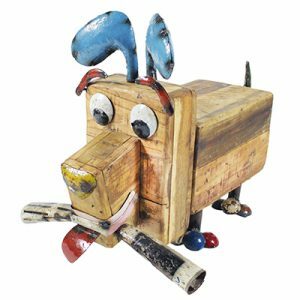 Add a splash of personality to your range with our lovable Elvis the Dog. Reimagined from Recycled hardwood pallets and finished with a timber oil to give that luxurious timer log feel and protected from the elements, ensuring your loyal friend will thrive in any home and climate. What garden is complete without it’s very own Dolly P sculpture? Reimagined from hardwood pallets, Dolly P small doesn’t require any assembly, she comes ready to rock. The metal decoration is created from recycled oil barrels. 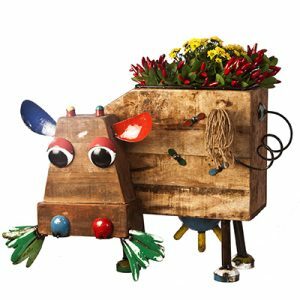 What better way to display plants than with a creative cow planter. Dolly P comes with a waterproof prime coating and can be cleverly drained by simply unscrewing her udder. 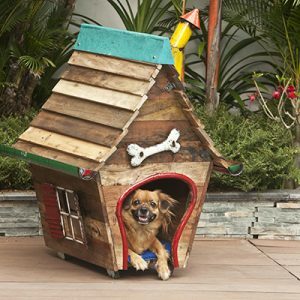 There is no denying that this doghouse is a stunning work of art. Dogs may not appreciate the aesthetics but they will enjoy the raised floor and covered window designed to look great and keep them dry. Beneath the comfy mat is a metal floor, which can be removed for easy cleaning. 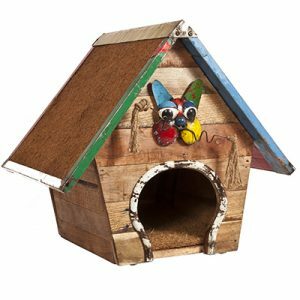 Cats will be in seventh heaven with this cosy cat house with built-in organic coconut fibre on the roof and floor for scratching. Its natural texture provides added satisfaction for your cat and because there is no glue or chemical treatment it’s the perfect cubby hole, providing a safe-haven all year round.